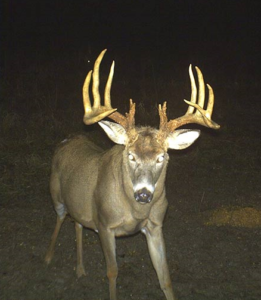 Our hunters will have a 60-70% on shot opportunity on trophy class bucks over 135”. We have undoubtably the best whitetail habitat you have ever seen! Timber ridges,draws, natural travel corridors, apple trees, acorns, 20+ ponds and literally thousands of acres of crown vetch! Our Food Plots are professionally managed by Mossy Oak Biologic Field Plot Specialist Brad Lockwood. These plots are strategically placed in timbered covered pockets so the mature bucks feel comfortable showing themselves in daylight hours. All our hunting is done from blinds or tree stands – there are no deer drives or spot and stalk hunting so our deer are not over pressured. We hunt on over 8,000 private acres managed to hold turkeys. Our properties are a good mixture of heavy timber, creek bottoms and professionally managed food plots. We kill several toms each year with over 10″ beards and 1 1/2″ spurs! Most of our turkey hunters bag 2 birds and because of that they keep coming back year after year. Our turkey hunting season in Ohio runs from April 18 – May 15th. The 1st half of the season is hunting til noon only so bring the fishing rods so you can enjoy one of the 20 stocked ponds on the property in the afternoons. If you are a novice and would like a guide you can hire one. Make sure you schedule a guide in advance.